SANTA CRUZ, Bolivia, June 16, 2014 (ENS) – “The fate of billions of poor people and the state of the planet depend on the success of our efforts,” UN Secretary-General Ban Ki-moon told leaders of the Group of 77 and China at their summit meeting Sunday in Santa Cruz. The leaders ended their two-day summit on Sunday by adopting the Santa Cruz Declaration, which covers sustainable development, climate change, technology, economy, trade, the building of democratic institutions, eradication of poverty and inequality, inclusion of women in development and global economic governance. “We will continue to accelerate our efforts but we have to be very practical,” Ban said, noting that there are just 440 days left to reach the UN’s Millennium Development Goals. These eight anti-poverty targets, set by world leaders in the year 2000, include a goal to ensure environmental sustainability. Some targets might not be met, Ban acknowledged. They will have to be part of the next set of development targets, which will be officially agreed upon next year on the 70th anniversary of the founding of the United Nations. The post-2015 goals must balance the needs of people and the planet, the UN chief stressed, urging the gathered heads of state and government representatives from more than 130 countries to act against climate change and the unsustainable use of natural resources. 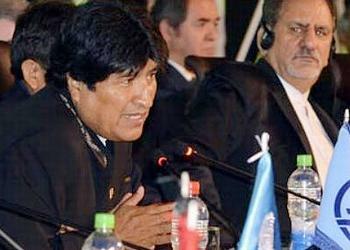 The “Declaration of Santa Cruz de la Sierra” stated as a priority of its member countries to eradicate poverty as main objective of the post-2015 development agenda, said President of Bolivia Evo Morales. The declaration emphasizes the problem of inequality, a situation exacerbated by unsustainable patterns of consumption and production in developed countries. “The declaration states that an excessive profit orientation does not respect Mother Earth and it is alarming the way big businesses can influence in the global economy with negative effects on development,” said Morales. The G77 was established by 77 States as a Group within the United Nations in 1964 to promote its countries’ economic interests. The group now includes more than 130 countries, about two-thirds of the UN membership, and over 60 percent of the world’s population. “All countries need to act on these priorities, individually and collectively. That is how I understand the theme of this Summit, a New World Order for Living Well,” he said. Ban will convene a climate summit in September when world leaders gather at UN Headquarters in New York for the annual General Assembly meeting. His goal is to build on momentum ahead of official talks in Paris next year when world leaders are expected to agree on a legally-binding treaty to limit climate-altering greenhouse gas emissions. In December, the governments that are parties to the UN Framework Convention on Climate Change (UNFCCC) will meet in Peru in their last official high-level meeting before the negotiations in Paris the next year. In Santa Cruz, Ban met with Peruvian President Ollanta Humala, asking him to “exercise his leadership to garner commitment for the drafting of a strong agreement.” President Humala re-affirmed his personal commitment to this goal, said a UN spokesperson. UN General Assembly President John Ashe highlighted the importance of stable and peaceful societies to sustaining development. “Conflicts, wherever they exist, are an impediment to development,” said Ashe, who represented his home country of Antigua and Barbuda when he chaired the G77 in 2008. Ban also urged the G77 leaders to uphold human rights, good governance and the rule of law in achieving sustainable development. Also on Sunday Ban met with President Nicolas Maduro of Venezuela, urging him to enhance assistance to Haiti, to address the cholera epidemic in the island nation. The UN chief also commended Cuba for hosting the peace talks between the Government of Colombia and the Revolutionary Armed Forces of Colombia, FARC. In a meeting with President Raul Castro, Ban said he hoped that, after decades, the conflict could end. The situation in Haiti was also discussed, a spokesperson said, as was climate change.